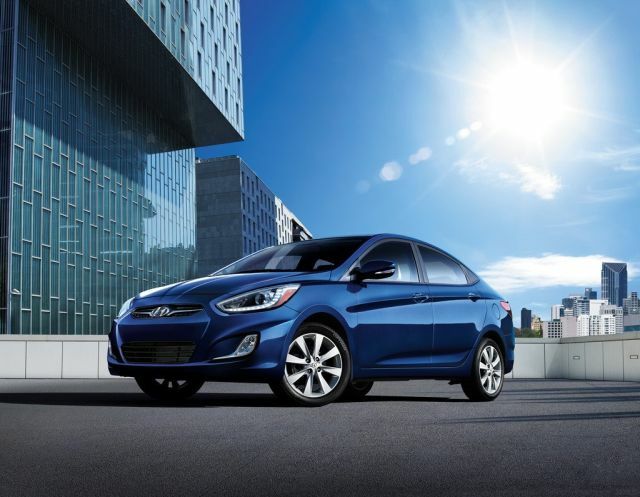 Turbo on tap for Hyundai’s 2015 subcompact Accent? These subcompact sedans and hatchbacks are in line for revised styling and an updated interior. New convenience features could be part of the mix, and a sporty-performance model could be added. Debuting for model-year 2012, this generation won’t be all-new again until least model-year 2017. To see what the midcycle freshening brings. Will it go beyond the usual restyled nose and tail to include gotta-have new features? Will the turbocharged four-cylinder from the kooky Veloster hatchback be added to the engine choices? Will you like these changes? Do so and you’ll get a solid small car with numerous features and a great warranty at a reasonable price. The ’15 won’t have big advances in engineering and key dimensions won’t be altered, so it’ll keep its surprisingly roomy cabin. Both body styles still attract the eye with swoopy curves that make them look more expensive than their affordable prices suggest And the ‘14s benefit from some equipment tweaks, including the addition of sliding sun visors and a driver-side blind-spot mirror, and a revised button layout for the audio system. The entry-level GLS sedan traded standard steel wheels for aluminums. And the Technology Package optional on top-line SE versions now includes keyless entry with pushbutton ignition and a rearview camera. Expect some cues from Hyundai’s redesigned 2015 Sonata midsize sedan to filter down, so the grille could get a bit more angular, its front fascia a little more aggressive. Wider use of LED inside and out is a good possibility, along with richer interior materials. So are new wheel designs. Otherwise, this pair of four-door will continue to share a chassis with the hatchback using a shorter body that beats the sedan for cargo room and versatility. It should return in GS and SE trim while the sedan reprises a single GLS grade. A sporty turbo model would likely get special aero-body addenda, but whether it’d be offered as a sedan, a hatchback, or both, only Hyundai knows. Front-wheel drive will carry over and so will a 138-horsepower 1.6-liter four-cylinder engine. If enthusiasts are thrown a bone with a new performance model, it will likely use the Veloster Turbo’s 201-horsepower 1.6-liter four and probably would be available with both the six-speed manual transmission and six-speed automatic offered in the less-racy Accents. This basic design is also used for the Kia Rio from the South Korean automaker’s corporate partner. Neither offers a hybrid or pure-electric version of its cars. Antiskid- and antilock-braking systems are standard across the board, but overall, road manners take a backseat to value-based packaging and attention-seeking styling. SE versions have firmer suspension tuning and come with the rear disc brakes that are optional on the GLS and unavailable on the GS in place of drum brakes. But all suffer imprecise steering feel and none handles as well as top alternatives like the Ford Fiesta, Honda Fit, or Chevrolet Sonic. Uncovering flaws in their test methods, Hyundai and Kia were forced to re-publish lowered gas-mileage numbers in 2012 and they financially compensated customers who purchased the affected vehicles. Engineers might eke out a small improvement as part of a midcycle update, but don’t expect much deviation from the 2014 ratings of 27/38/31 city/highway/combined with the manual transmission and 27/37/31 mpg with the automatic. If the turbocharged engine becomes available figure ratings of around 24/35/28 mpg with manual, 24/31/28 with automatic. Lots of standard kit for the buck is a brand hallmark and it’s on display here with standard features for which rivals charge extra – or don’t even offer on their subcompacts. Every iteration of this vehicle, for example, comes with body-color heated mirrors, tilt steering column, vanity mirrors, rear-seat heater ducts, and USB iPod and auxiliary jacks. Power windows/locks/mirrors, remote keyless entry, and a height-adjustable driver seat also will continue as standard. Bluetooth connectivity with voice recognition, a tilt and telescopic steering wheel, and cruise control should again be standard on the SE and available on automatic-transmission GLS’s as part of a Premium Package that also includes steering-wheel-mounted audio controls and premium cloth upholstery. A power sunroof option has been limited to the SE model; no versions offers leather upholstery. And we’d be impressed to see a navigation system offered, as on such rivals as the Fiesta and Fit. They’ll increase slightly, but expect these to remain among the least expensive new cars in America. These estimated base prices include the manufacturer’s mandated destination fee, which was $810 for 2014 models. Look for the ’15 GLS sedan to start around $15,850 with manual transmission and around $16,850 with automatic; its popular Premium Package will likely remain priced around $1,400. Project the GS hatch at around $16,000 with manual, $17,300 with automatic. The SE should again come standard with the automatic and begin around $18,650. A turbo addition would likely start where the SE leaves off and be priced from around $22,000. For well under $20,000, you can drive away in a very solid small car that comes with one of the industry’s best warranties. The standard limited warranty lasts for five years or 60,000 miles, whichever comes first, and includes roadside assistance. Certain engine and transmission components are covered for 10 years or 100,000 miles.